Where does true thankfulness come from? Can we be thankful even when we face trials? 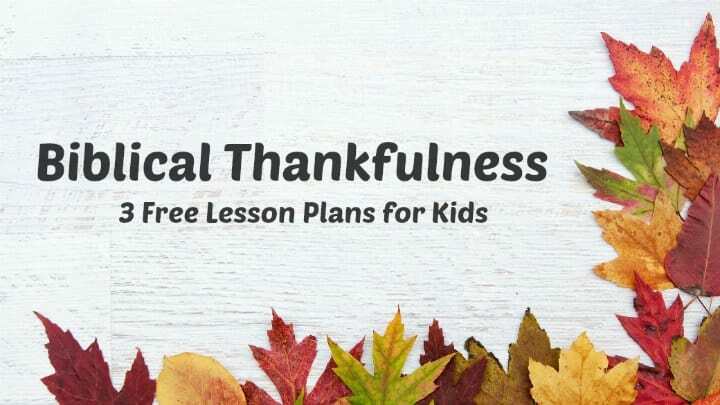 “Thankful to God (Biblical Thankfulness – Lesson 1)” is the first of three lessons helping children understand the ultimate reason we should be thankful. Also, children will learn that we can be thankful even when we face hard times. Click here to preview lesson 2 and lesson 3. If you’re in a hurry, simply use the link button below to download all 3 lessons in an easy to print PDF file. COLORING SHEETS: We have several thanksgiving coloring pages, you can click here to download directly. OBJECTIVE: To understand that true thankfulness comes from knowing Jesus Christ as our Savior. MAIN IDEA: Thankfulness comes from having a relationship with Jesus and understanding God’s love for us. We should choose thankfulness even in difficult situations because we already have victory through Jesus Christ. MORE IDEAS: Don’t miss our large collection of Thanksgiving ideas for children’s ministry. Say, “When you think about the holiday we call Thanksgiving what comes to mind? Today we are going to talk about true thanksgiving. First, let’s start by listing things we are thankful for on the board.” Allow a few minutes for the students to comment. Afterward, emphasize that today’s lesson will teach us what the bible says about thankfulness. Comment, “The bible tells us what we should be most thankful for.” Read Colossians 2:6-7. Explain that true thankfulness comes from knowing Jesus Christ! Say, “When we are faithful to God and choose to obey his commands then we will experience true thankfulness.” Share about a time when you were overwhelmed with thankfulness for your relationship to Jesus Christ. Then briefly outline the gospel message and invite students to come into a relationship with Christ if they do not already know him. Lastly, write “knowing Jesus” on the board. Next read Psalm 136:1. Ask, “According to this verse, why should we be thankful to God (because his love endures forever)? How do we know this promise is true (because he sent us Jesus and shows his love by taking care of us)?” Ask a volunteer to share about a time in their life when God took care of them. Then add “God’s love endures forever” on the board. Say, “We should also be thankful because God gives us victory through Jesus!” Read 1 Corinthians 15:57. Explain that God does more than provide salvation and take care of us – he gives us daily victory over life’s trials. Comment, “Because we are victors, we never have to wonder if God will help us through our troubles. We have confidence that he will always be with us, and that should make us extremely thankful.” Write, “We have victory through Jesus” on the board. Pass out the paper and craft supplies. Say, “We are going to spend the rest of our time today writing letters of thankfulness to God. This is not something we are going to share with one another, but it is a serious time of reflection. Please remain quiet as you work.” Allow the students to decorate their letters when they finish writing. Encourage them to keep the letters in a place where they can read it often as reminders to be thankful to God. RECAP: True thankfulness comes from knowing Jesus as our Savior and experiencing God’s eternal love. No matter what we face, we can choose thankfulness because we have victory in Jesus Christ. As a teacher I find your lessons are very well done, and as a Christian worker, I find the content has a solid Biblical base. Well done and thank you for your effort and accessibility to such resources. I used your Harvest lesson 2 weeks ago! Thank you for the wonderful lesson plans that are true to the gospel. Thank you for sending me these lessons.. This will be a great help.. God bless you more!! Thank you so much for your help in sharing your lesson to me and for the students ministry here in the Philippines. May God continue to bless and use you in this ministry. Thanks. Thank you so much for sharing these lessons! So kind. Tony Kummer (Editor) reviewed & updated this page on : November 21, 2018 at 10:05 am. All our content is peer reviewed by our readers, simply leave a comment on any post suggest an update.